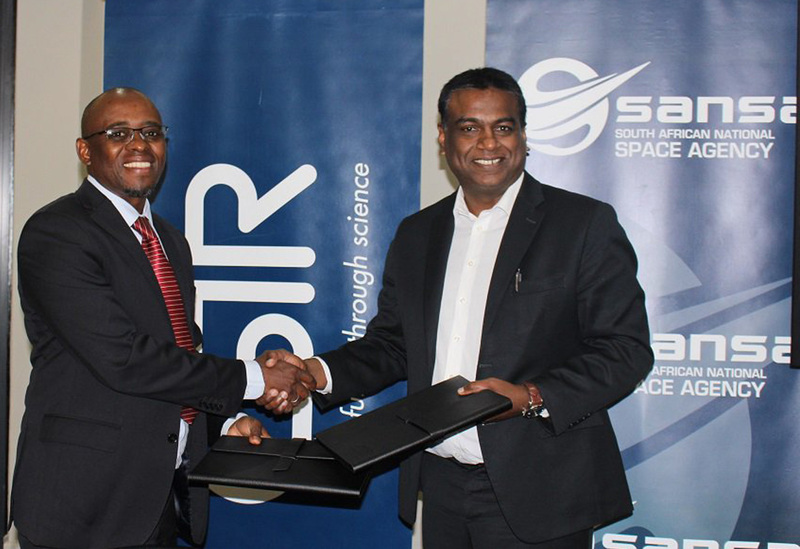 The Council for Scientific and Industrial Research (CSIR) and the South African National Space Agency (SANSA) will continue to work together in fostering research and supporting industrial development in space sciences and technologies. Today, 16 October 2018, the two organisations renewed a Memorandum of Understanding (MoU) which will see greater support in strengthening the implementation of the space strategies of the Department of Science and Technology (DST) and the African Union (AU). The first MoU between the CSIR and SANSA was signed in November of 2013. The renewed agreement was signed in Pretoria by the CSIR CEO, Dr Thulani Dlamini and SANSA CEO Dr Valanathan Munsami. Together, the organisations aim to maintain and grow South Africa’s rich tradition in space science, dating back to the 1950s, which has positioned the country as an active participant in the global space arena and with unique space infrastructure. According to the two organisations, the signing of the memorandum is expected to optimise South Africa’s investment in research and development within the space industry and maximise existing benefits of space services and applications for the benefit of society. Speaking at the signing ceremony, Dr Dlamini hailed the partnership as a significant step towards improving research and to develop new industries in the space sciences and technology areas. “This partnership will enable us to draw on each other’s research capabilities and infrastructure in order to develop new industries which will positively impact our economy and help us realise our mandate of improving the quality of life of South Africans through science and technology”, said Dr Dlamini. The South African National Space Agency Act, 36 of 2008, mandated the establishment of a National Space Agency to provide for the promotion and use of space and cooperation in space- related activities, foster research in space science, advance scientific engineering through human capital and support the creation of an environment conducive to industrial development in space technologies within the framework of national government policy.